Last Thursday I had the pleasure of attending the Insurance ERM conference “Data for ERM & Solvency II“. The focus of the day was firmly on data and its importance in the risk management of insurers, something of a personal hobby horse of mine, now that I’ve spent the last 18 years of my working life on that very topic! It was particularly pleasing to find that many of the insurers attending the event were looking beyond the regulatory compliance aspects of data management and saw the governance and maintenance of their own data as key to the success of their organisations in the digital age. David Lodge (Allianz) gave an excellent presentation on taking a pragmatic approach to implementing a Data Governance framework. A quote he attributed to his CEO explained that their organisation only had two unique assets “people and data”. It’s worth taking a moment to consider to what extent your business strategy is aligned to leveraging your own unique corporate assets, which I’d argue as a minimum should include those two. 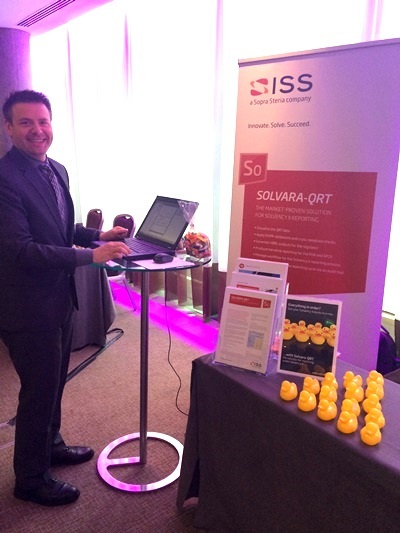 My colleague Slaven (pictured) proved a big hit during the coffee breaks and not only on account of the bowls of Haribo at our table but also his demonstration of our fully featured software solution for the last mile of Pillar 3 – SOLVARA-QRT, which will be used by over 250 insurers to get their Solvency II ducks in a row. Later in the day I enjoyed the panel discussion with Richard Charlton (Phoenix Group) and Dominic Rau (Swiss Re) who highlighted the challenges of coping with both the variety of data required by an ‘internal model’ and also the subsequent maintenance of robust and detailed documentation of that model. The “simple” logistics of maintaining and operating an internal model have too often only been considered in Solvency II programmes as an afterthought. The initial rush to implement exciting and exotic new algorithms has understandably been a key focus though, ultimately, the BAU success of an internal model is tied to its usability. Recently we have helped a number of our clients implement data and knowledge management solutions to ease the headache of model updates and meet the requirements of the ‘use test’. The conference closed with an insightful presentation delivered by Peter Telford (Legal & General) on the division of data management responsibilities between the first, second and third lines, but not before he’d won our prize draw for an iPad Air 2! Thanks to all at Insurance ERM for organising a very entertaining and informative conference on what can be something of a dry topic. What are your thoughts about data and its importance in the risk management of insurers? Leave a reply below or contact me by email. Next Next post: The next digital disruption: buying B2B services using social media channels?